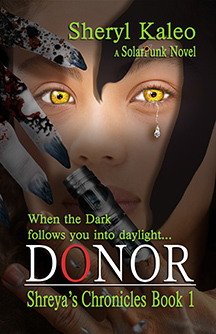 DONOR Parts Simplified | Sheryl Kaleo... var scss_share_image="https://www.sherylkaleo.com/wp-content/uploads/2015/11/Sheryl-Kaleo-Banner-copy-copy.jpg"
DONOR was first offered as a serialized novel in four parts as a way of introducing my novel to new readers. But what I found happening is that readers thought each part was a full novel unto itself. Now I see there were things I could have done differently to make it clearer. All in all, the effort was a great learning experience, but to make things simpler, I’ve decided to offer only the full novel. I may eventually try serializing another novel. It was fun releasing a book in parts. But right now with limited time to manage so many moving pieces, I’d decided to keep it simple. Thank you to everyone who helped me learn so much from this wonderful experiment. The full novel DONOR can be found on my Amazon Author, Kobo, Smashwords, and Barnes & Noble pages. This entry was posted in For Readers, News & Appearances. Bookmark the permalink.